Pioneers in the industry, we offer lobe compressor, air root blower and twin lobe air cooled compressor from India. Lobe Compressor used in various systems and plants like Sewage Treatment Plants. These are High volume-low pressure positive displacement (PD Type) Roots Blowers. They operate on differential pressure and constant volume characteristics. We manufacture a wide range grouped under air cooled or water cooled design which covers capacities from 50 M³/Hr to 1350 M³/Hr. We manufacture these machines Twin Lobe Rotary Compressors, positive displacement blowers in our state-of-the-art modern facility equipped with CNC machines, CAD-CAM software and efficient production control system. Packaging Details: We are offering wooden box packing if required. Features 100% Oil Free Compression, Low Noise, Low Maintenance. 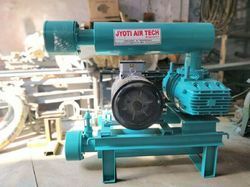 These are positive displacement Type Air Root Blower suitable for a wide range of operating speeds to meet the exact capacity & Discharge Pressure requirements of the applications. They can be offered for pressure duty up to 10,000 mm wg and vacuum duty up to 6,000 mm WG. Two stage machines can be offered for pressure up to 22,000 mm WG. These machines can be used for compression or boost of vacuum gases. The working chamber consists of two parallel cylindrical bores containing two rotors, each with two lobes which counter rotate without touching with each other, or the casing. Heavy duty gears ensure that a correct clearance is maintained between the rotors. The working chamber requires no lubrication hence the medium handled does not get contaminated with oil. Packaging Details: We are offering heavy wooden box packing if required. Twin Lobe Air Cooled Compressor used in various systems and plants like Sewage Treatment Plants. These are High volume-low pressure positive displacement (PD Type) Roots Blowers. They operate on differential pressure and constant volume characteristics. We manufacture a wide range grouped under air cooled or water cooled design which covers capacities from 10 M³/Hr to 14000 M³/Hr. We manufacture these machines Twin Lobe Rotary Compressors, positive displacement blowers in our state-of-the-art modern facility equipped with CNC machines, CAD-CAM software and efficient production control system. Delivery Time: within week after receiving PO. Looking for “Twin Lobe Compressor”?